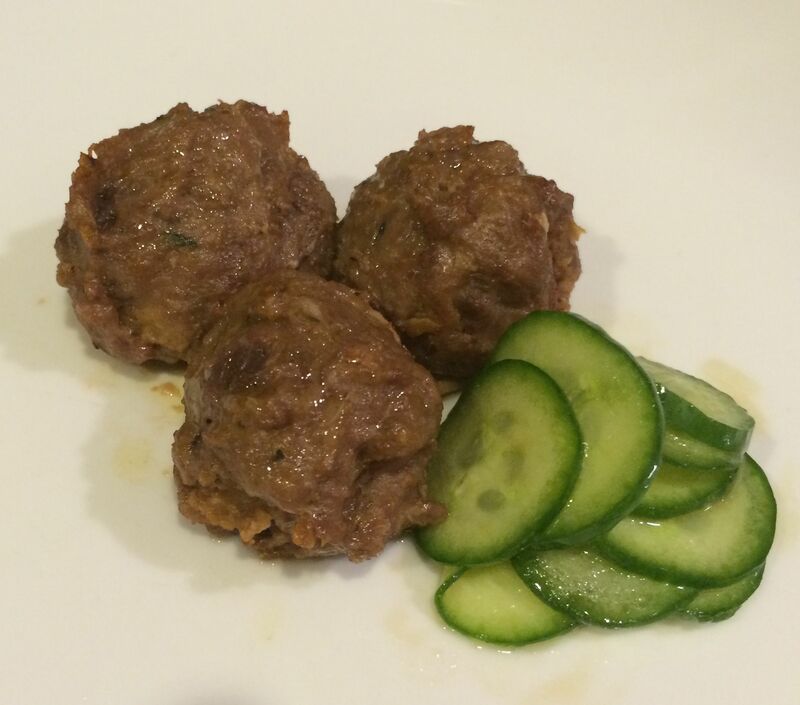 To say that these meatballs were a success in my house is a huge understatement. I had bought some grass-fed beef intending to make bolognese sauce but had to change the plan and eliminate the pasta last-minute. I didn’t have the ingredients for my usual meatballs so I scanned my fridge to see what the options were. My eyes landed on the red miso and I thought its deep, salty umami flavor would be a perfect complement to ground beef. When most people think of miso they think of white miso, which is what you would make a traditional sushi-restaurant miso soup with. Red miso, however, is saltier and more intense in flavor. You can make soup with it too, but it’s also good for glazes, braises and recipes that call for deeper flavors. Not all miso is made from only soybeans. There are some that incorporate rice, and some that blend soy and grains, so read the labels if you have dietary restrictions. If you are looking for soy-free miso there are some made from chickpeas and barley. I also use fish sauce in the mix, an ingredient that not everybody has in their pantry. You can substitute soy sauce instead, but I would recommend starting with one teaspoon, cooking off a bit of the mix to taste and then adding the second if it’s not too salty. Slow cooked vegetables are also folded into the meat mix, like carrots, onion and garlic that have sweat out and become buttery and soft. This adds sweetness and helps the meatballs stay tender. Both girls cleaned their plates, asked for seconds and requested that I make them again right away. These meatballs are so savory and flavorful that a sauce wasn’t necessary. They are great with some sautéed bok choy or chinese broccoli and rice, or as a snack or lunch with cucumbers tossed in sesame oil, rice wine vinegar and soy sauce, but honestly we end up eating them with whatever is around. I even send my eldest daughter to school with them for lunch. 2. Place carrots and onion in a bowl of a food processor and pulse until vegetables are finely chopped. 3. Add your fat or oil to a medium-sized saucepan with a lid. Dump in the finely chopped vegetables, garlic, bay and thyme. Heat on medium until vegetables begin to sizzle. Cover and cook, until vegetables are melted, soft and buttery, about 10-15 minutes, stirring often. If your pan is too large, the vegetables will want to burn so watch the heat and if you need to, add a splash of water. If your heat is too high, they will brown before they cook. What you are trying to do is cook them slow and low so that the water cooks out of them first, and then they start to caramelize so the sweetness will start to concentrate. 4. In a large bowl combine ground beef, vegetable mixture and all remaining ingredients. Mix well with a wooden spoon or gloved hand so that the miso is fully incorporated into the ground beef, no chunks of it remain and the mixture is slightly sticky. 5. Drop rounded heaping tablespoon sized balls on to a baking sheet about 1 inch apart and bake for 10 minutes. 6. Let cool slightly, remove meatballs from tray and serve. Don’t be afraid to take a piece of bread and sop up all the fatty delicious juices that have leached out!